KI4U Nuke Prep Expertise & Solutions! 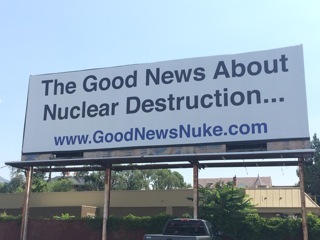 The Good News About Nuclear Destruction! We've been promoting Nuclear Civil Defense Training of the public for close to two decades! FREE Radiation Contamination Testing For Your Home & Local Area! "KI4U's practical family nuclear disaster guides and essential resources address a critical void in our nations nuclear preparedness. For over a dozen years they've been the model of what I'd have liked to have seen DHS and FEMA doing all along in a very big way nationwide." - Senior Scientist at Science Applications International Corporation (SAIC), McLean, VA.
- Radiation Hazards Physicist at U.S. Atomic Energy Commission (AEC), Washington, D.C.
We've been promoting Nuclear Civil Defense Training of the public for close to two decades. See where our proposal was voted & ranked #1 at DHS & FEMA National Dialogue on Preparedness a year before Fukushima! Two months after the above Local, State, Tribal, and Federal Preparedness Task Force produced a report of findings and recommendations for Congress, we saw in the NYTimes U.S. Rethinks Strategy for the Unthinkable and from USAToday L.A. dry run shows urban nuke attack 'a survivable event'. 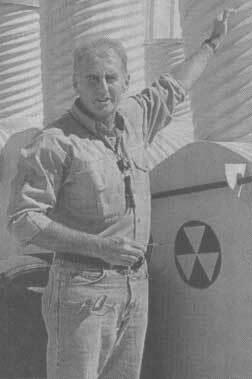 We'd like to think we helped spur along that govt reassessment of the utility of Civil Defense training of the public for nuclear disasters. We'd hoped the govt would follow up with a comprehensive program to instruct the public in the specifics of how to better survive a future nuclear event. We're still waiting, but in the meantime, fortunately, we still have our FREE guides available; The Good News About Nuclear Destruction! and What To Do If A Nuclear Disaster Is Imminent! 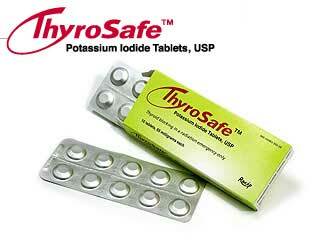 We've also been offering Potassium Iodide (KI) tablets, the thyroid-protecting anti-radiation pills since 1999, long before most saw any need for it. We've supplied the Federal Government, military, and many state and municipal governments, as well as to doctors, hospitals and pharmacies. (Including 300,000 doses of Potassium Iodide pills ordered shortly after 9/11 by the Office of Emergency Preparedness, and picked up by Lear Jet the same day.) Also, tens of thousands of individuals and families have bought KI direct from us via the internet here. We've invested heavily to secure the largest private emergency inventory of Potassium Iodide (KI) in the USA, and delivered over 6 million doses worldwide since the Fukushima tragedy, but still know this won't be anywhere near enough in a future major nuclear emergency. Nor, is enough of it likely to be exactly where it's needed when the time comes, either, until the day every family already has their own supply. We are the exclusive national distributor of ThyroSafe™, the only FDA approved split-dosage, essential to prompt and accurate dosing of children. Our popular informational FAQ site details it all at 'Potassium Iodide Anti-Radiation Pill FAQ' which begins further down this same page. Additionally, eight months prior to 9/11/01, we acquired from FEMA over 100,000 Civil Defense radiation detecting survey meters, dosimeters, monitors and geiger counters from the Federal Depot in Fort Worth, TX. That required 12 tractor trailers to ship the 416 pallet loads down to our warehouse/lab in Gonzales, TX. Our inventory here represents the largest non-government source of these Civil Defense radiation detector instruments and we are the only private rad lab in the country that specializes in re-calibrating these CD survey meters, geiger counters, dosimeters and monitors. 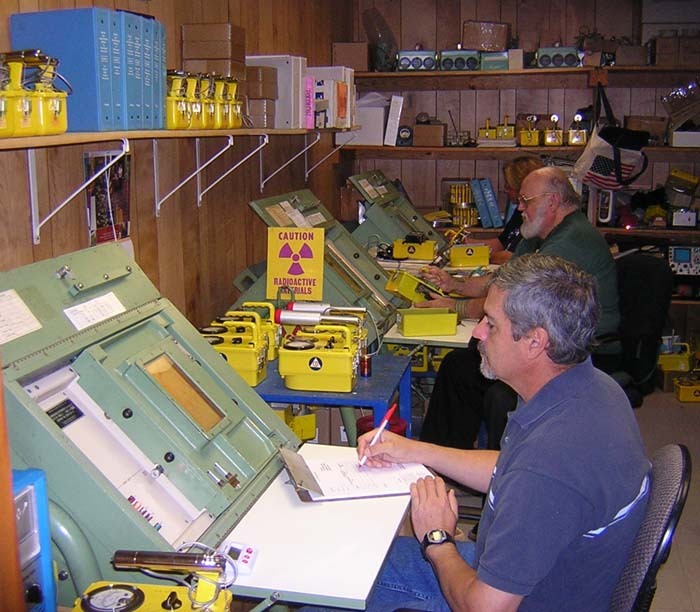 We are licensed and authorized to re-calibrate and re-certify these radiation detection instruments with our three high-range Cesium-137 calibrators here and our lab staff of 6 trained & certified radiological employees. We utilize the unique Dept. 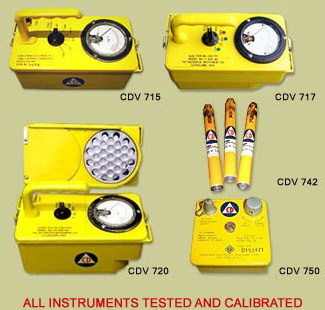 of Army - Office of Civil Defense calibrators that were specifically made for calibrating all these Civil Defense survey meters and dosimeters. We are licensed to do so in conformance to the standards as set forth by the State of Texas Bureau of Radiation Control, FEMA, ASTM and the NRC, all of which we adhere to. 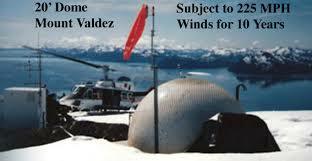 We also make them available, along with FEMA manuals, to government agencies and the general public here. The fallout shelters are not our fastest sellers... yet. We often feel here like Noah building mini-arks, and until the fallout begins to rain down, most folks won't take the need for one seriously. Of course, most didn't take terrorism & KI seriously either, before 9/11. But, that's OK, too, IF you learn now how readily you can make a corner of your home into a truly effective family fallout shelter. You'll be pleasantly surprised discovering in our FREE guide; WHAT TO DO IF A NUCLEAR DISASTER IS IMMINENT! how little time, money, and energy it really requires to make that essential difference for your family survival. Abandon any myths of nuclear un-survivability and prepare your family now to endure confidently, when you discover the facts there and at THE GOOD NEWS ABOUT NUCLEAR DESTRUCTION!. More recently, after eight months of R&D with military contractor, we were proud to have introduced in July of 2010 the RADSticker™ peel & stick, postage stamp sized, instant color developing dosimeter. 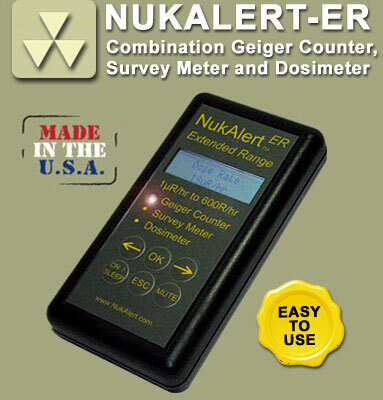 This inexpensive $5 dosimeter will both dampen public panic and safely enable First-Responders into where most needed in a future radiation emergency. See the RADSticker™ here. And, even more recently, we've opened our lab up to the public with FREE Radiation Contamination Testing For Your Home & Local Area! 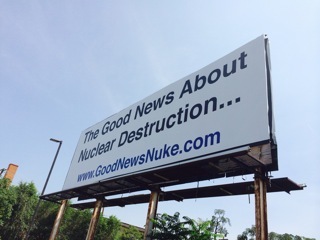 And, in July, 2014, with Physicians for Civil Defense we put up the first Good News About Nuclear Destruction billboard in SLC, UT. Our primary mission, thoughout, has always been one of education and dispelling the myths of nuclear and radiation un-survivability that hold back the majority from seriously embracing life-saving family preparations. 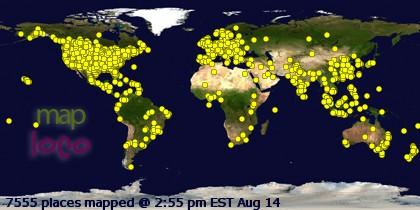 See/read; THE GOOD NEWS ABOUT NUCLEAR DESTRUCTION! If/when the country is ever in a panic again, like during the 'Cuban Missile Crisis', everyone will also need our FREE guide; WHAT TO DO IF A NUCLEAR DISASTER IS IMMINENT! And, our latest guide detailing protection from overseas fallout; When An ill Wind Blows From Afar! 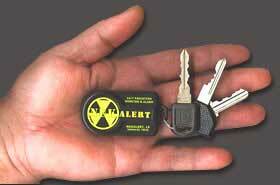 We've been promoting Nuclear Civil Defense Training of the public for well over a decade. See where our proposal was voted & ranked #1 at DHS & FEMA National Dialogue on Preparedness a year before Fukushima! For much of the above, we are the sole public source. And, we are continually developing new innovative solutions which can all be found and seen on our products page at www.KI4U.com/products1.php And, links to our popular and acclaimed, very practical, informational FAQ's. 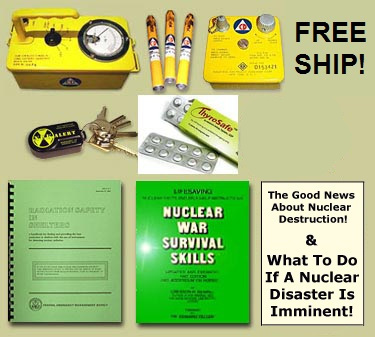 And, for two of the books we sell; 'Nuclear War Survival Skills' and the FEMA 'Radiation Safety in Shelters' they are also both available to just read or print out for free there, too! Also, all our product pricing is very competitive as we strive to assure that more fellow Americans might then be able to afford these essential family preps. Our modest profit attitude here is that it's a tool to build ever larger emergency inventories now for the coming need, to then be able serve more on that day 'none will ever forget'. We look at all of this like you would medical or fire insurance, where you never acquire it eagerly looking forward to getting to use it anytime soon, but will be very glad to have it, if it is ever needed! We tell all our product customers that we hope/pray these nuke preps all get a chance to gather much dust upon their shelves un-used for many years! I've got a family, kids and grandkids now, too, and truly wish none of these preps was needed. I'd eagerly, and quite joyfully, go about finding something else to do, if that was the case. Unfortunately, it is not. Feel free to call or e-mail me, if any questions or comments. billboard promotion web site here! Click Here For KI4U Products! BTW, We are no 'Johnny-Come-Lately' sounding the call to prepare! In fact, we've been well ahead of the curve for quite awhile now! Check out our pre 9/11 Press Releases in 1999 and 2000, too! Few others were warning to prep for nuclear terrorism back then! When An ill Wind Blows From Afar! Overseas Fallout Coming Here! Story & Photos of KI4U, Inc. New Orleans Katrina Emergency Response! Venezuela's Chavez 'Clear and Present Danger' revealed here a decade ago! © www.NukAlert.com 2003, 2004, 2005, 2006, 2007, 2008, 2009, 2010, 2011, 2012, 2013, 2014, 2015, 2016. All Rights Reserved. © www.RadShelters4U.com 2002, 2003, 2004, 2005, 2006, 2007, 2008, 2009, 2010, 2011, 2012, 2013, 2014, 2015, 2016. All Rights Reserved. © www.RadMeters4U.com 2001, 2002, 2003, 2004, 2005, 2006, 2007, 2008, 2009, 2010, 2011, 2012, 2013, 2014, 2015, 2016. All Rights Reserved. © www.KI4U.com 1999, 2000, 2001, 2002, 2003, 2004, 2005, 2006, 2007, 2008, 2009, 2010, 2011, 2012, 2013, 2014, 2015, 2016. All Rights Reserved.